﻿ 2 Corinthians 3:3 being manifested that you are a letter of Christ, cared for by us, written not with ink but with the Spirit of the living God, not on tablets of stone but on tablets of human hearts. since it is plain that you are Christ's letter, produced by us, not written with ink but with the Spirit of the living God; not on stone tablets but on tablets that are hearts of flesh. being seen that ye are a letter of Christ, administered by us, written not in ink, but in the Spirit of the living God, not in stony tablets, but in fleshly tablets, in hearts. You people show [i.e., by your conversions] that you are a letter from Christ, delivered by us [i.e., the result of our ministry], not written with ink but with the Holy Spirit of the living God; not on stone tablets [i.e., as in the case with Moses' ministry], but on tablets of the human heart. [See Jer. 31:33; Heb. 8:10]. you are well known to be a letter of Christ, written by us as his ministers, not with ink, but with the Spirit of the living God, not in tables of stone, but in fleshy tables of the heart. 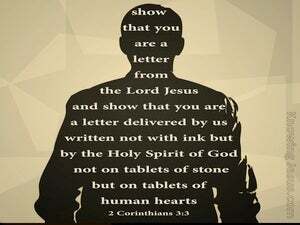 You show that you are a letter from Christ, delivered by us, written not with ink but with the Spirit of the living God, not on tablets of stone but on tablets of carnal hearts. which shows you to be the epistle of Christ, written by my ministration, not with ink, but with the spirit of the living God; not on tables of stone, but on living tables of the heart. being manifested to be Christ's epistle ministered by us, written, not with ink, but the Spirit of the living God; not on stone tables, but on fleshy tables of the heart. being manifest that you are the letter of Christ, having been ministered by us, having been written not with ink, but with the Spirit of the living God: not in tables of stone, but in tables that are hearts of flesh. You show that you are a letter from Christ delivered by me, written not in ink, but in the Spirit of the living God, and not on tablets of stone, but on the human heart. Manifestly declared to be the letter of Christ ministered by us, written not with ink, but with the Spirit of the living God, not in tables of stone, but in the fleshly tables of the heart. Made manifest that ye are the epistle of Christ served by us, not written with ink, but with the Spirit of the living God; not in tables made of stone, but in fleshly tables of the heart. 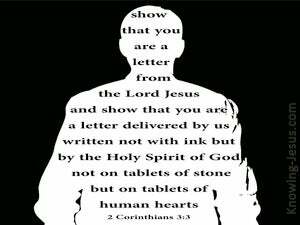 revealing that you are a letter of Christ, delivered by us, inscribed not with ink but with the Spirit of the living God, not on stone tablets but on tablets of human hearts. it having been made plain that you are the epistle of Christ, ministered by us, not having been written with ink, but with the Spirit of the living God; not on tablets of stone, but in fleshly tablets of the heart. in that ye are known, how that ye are the epistle of Christ, ministered by us and written not with ink, but with the spirit of the living God; not in tables of stone, but in fleshly tables of the heart. you make it obvious that you are a letter of Christ which I have been employed to inscribe, written not with ink but with the Spirit of the living God, not on tablets of stone but on tablets of the human heart. Since all can see that you are a letter of Christ transcribed by men, written not with ink, but with the Spirit of the living God, not on tablets of stone, but on human hearts as tablets. since ye are manifestly shown to be a letter of Christ by means of our service, written not with ink, but with the Spirit of the living God; not on tablets of stone, but on fleshly tablets of the heart. for you are manifestly an epistle of Christ delivered by us, written not with ink but with the Spirit of the living God, not on tablets of stone but on tablets of hearts of flesh. 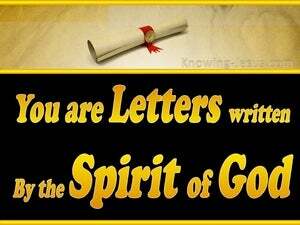 Manifesting yourselves that ye are a letter of Christ, ministered by us, - inscribed - not with ink, but with the Spirit of a Living God, not in tablets of stone, but in tablets which are hearts of flesh. because ye are manifestly seen to be the letter of Christ, of which we have been the secretaries, written not with ink, but by the Spirit of the living God, not on tables of stone, but on the fleshly tables of the heart. 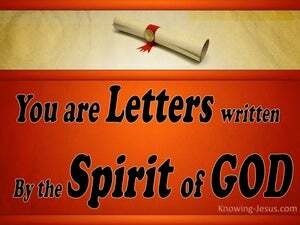 for you are always showing that you are a letter of Christ, produced by my service, written not in ink but by the Spirit of the living God, not on tablets of stone, but on human hearts. being made manifest that ye are Christ's epistle ministered by us, written not with ink, but with the Spirit of the living God; not in tablets of stone, but in tablets that are hearts of flesh. being manifest that ye are the epistle of Christ, through our ministration, written not with ink, but by the Spirit of the living God; not on tables of stone, but on tables of the heart of flesh. 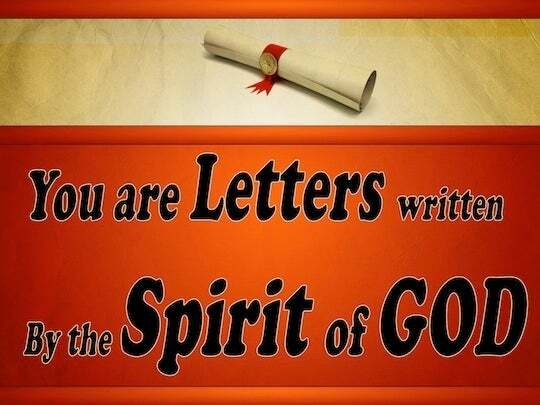 2 You are our letter, written in our hearts, known and read by all men; 3 being manifested that you are a letter of Christ, cared for by us, written not with ink but with the Spirit of the living God, not on tablets of stone but on tablets of human hearts. 4 Such confidence we have through Christ toward God.